The government on Friday slashed the import tariff value of gold marginally to $550 per 10 grams amid weak global prices of the precious metal. The tariff value of silver has, however, been hiked marginally to $1062 a kg. The tariff value is the base price on which the customs duty is determined to prevent under-invoicing. 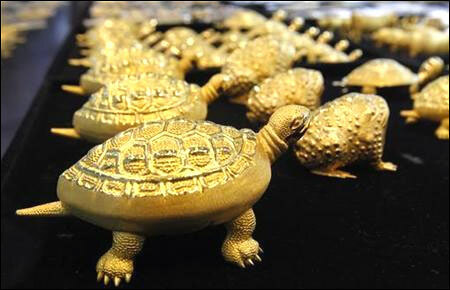 During November, tariff value of gold stood at $561 per 10 grams and of silver at $1058 a kg. The Central Board of Excise and Customs ( CBEC) today issued a notification in this regard. Apart from precious metals, the government reduced the import tariff value of RBD palmolein to $872 per tonne from $887 a tonne in the last month. The import tariff value of brass scrap has been increased to $4069 per tonne from $4,029 a tonne in the review period. The government decided to bring down the import tariff value of precious metals as global prices have weakened. Gold was costing $1,697.35 an ounce in Singapore, the least expensive since December 7. In the national capital, gold prices today declined for the second consecutive day to Rs 31,400 per ten gram taking cues from global market. Traditionally, India has been the world's largest consumer and importer of gold. Last year, imports was to the tune of 969 tonnes. However, doubling of the excise duty to 4 per cent in the last budget and the curbs that RBI imposed on gold loan value (down from 85-90 per cent of the value of jewellery to 60 per cent) and banning banks from funding gold purchase by loan companies have led to sharp drop in imports. In April-October, gold imports declined 35 per cent Y-o-Y and overall imports is set to drop over 17 per cent to 800 tonnes this year.